It’s time to look at the next Equestria Girls special. This time it is centered around Rarity. Once of the Magic specials was also about her so she’s certainly getting around. Unfortunately this is definitely not her best appearance but she finally gets a big fight scene so that was cool. As always, this was a pretty fun special and since it is fairly short we got to the meat of the story right away. Applejack and Rarity applied for a position a long time ago with a famous movie star. Unfortunately Applejack did not get the position while Rarity did. Rarity even got a promotion before starting. Vignette shows up to introduce herself and unfortunately she seems to be very self absorbed. Immediately Rarity begins gravitating to her more than the other characters and Applejack begins to feel left out. At first she thinks this may just be normal jealousy, but is it possible that Vignette is actually shadier than she appears? Naturally you’ll be a little irritated at Rarity betraying her friends so quickly. It’s not out of character or anything as Rarity tends to do this a lot, but after all they’ve been through together you’d just expect her to do a little better. That’s why Rarity has never been one of the better members of the Mane 6. She’s probably the only one who doesn’t really fit her element all that much. Still, she does work to make amends for all of this during the film. Her fight with Vignette is fun as she can reflect energy while Vignette can project it. I would have liked to have seen Rarity fight a little more, but what we got was certainly sound so I can’t complain there. Vignette makes for a solid villain. You always want to have a rich villain because it makes sense when they take the whole thing in stride. Vignette has always gotten what she wanted in the past so it makes sense that once she got such a cool weapon she would begin using it. She doesn’t owe society anything after all. The ending can maybe get a little cheesy with her, but she was never inherently evil I suppose. She was just super naive and possibly evil. She just needed to remember that social media friends are real friends. Once she accepts that then she will really be a better person. Applejack looks reasonably good here even if she possibly does take Rarity’s betrayal a little too hard. She’s still friends with the rest of the girls so that should be a nice consolation. Even if Rarity were to leave she would have a bunch of friends. Still, it’s because she took the whole thing so seriously that she was able to find out Vignette’s real objective. Applejack may not have been able to win in their encounter, but it’s hard to deal with one hit KO attacks. The other characters mainly get the shaft here as naturally not everyone can get a whole lot of screen time. Still, they all contribute here and there. Sunset once again showed that she has the greatest skills out of all the characters. She was able to win in a game that was made to be rigged. If that’s not talent then I don’t know what it is! Twilight did her best but playing by the book doesn’t always work. She needed to throw her ring with her heart instead of her mind. There’s only one bad subplot here and that is the one with Fluttershy and Rainbow Dash. It’s an annoying trope that I can’t say I’m surprised to see. 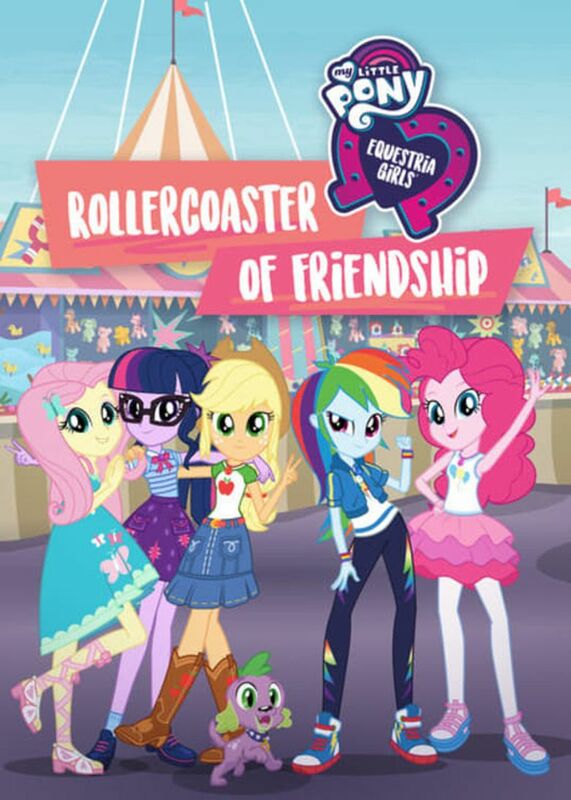 Rainbow Dash is usually the brave character so naturally the film thought it would be humorous if she got scared of the roller coaster while Fluttershy could handle it. I’m fine with Fluttershy not being scared for once even if that seems odd, but Rainbow Dash shouldn’t be nerfed. The whole thing feels super forced and as a result Rainbow Dash looked pretty bad here. Naturally the animation is pretty consistent with the rest of the series. The character designs aren’t bad and the animation is pretty good. There aren’t really any memorable songs here this time, but the intro theme to the special is always fun. It does remind me that the main MLP show needs a theme song revamp at some point. Something with a cool techno/rock beat to it. I think that would take the music to the next level.